The Oakland quartet blends the personal and political on their debut LP — using infectious pop melodies to grapple with ecological crises. Trails and Ways album release show is on Friday, June 5 at the Independent (628 Divisadero St., San Francisco). TrailsAndWays.com. 9 p.m. $13-15. One night in 2011, in the middle of a packed San Francisco dance club, Keith Brower Brown couldn't stop thinking about the end of the world. The Oakland-based guitarist and vocalist, who studied environmental economics and geography at UC Berkeley, often contemplates the impacts of climate change — but that evening was different. "I just felt like we were having this bacchanal in the middle of planetary destruction," he recalled, lamenting the fact that marches dedicated to climate change activism don't attract the same collective energy found on the dance floor. "I was thinking about how we're all underground and what would be left in this underground space in a thousand years after our society has turned the earth into shambles." Brown's vision of ecological collapse inspired him to write "Skeletons," a single for his pop quartet Trails and Ways, which is releasing its debut album this week. In the pre-chorus of the song, which opens the LP, Pathology, Brown sings: I know when they dig us up/I know what they'll find/skeletons dancing/at the scene of the crime. While "Skeletons" is rooted in Brown's frustrations at the club, the song features an upbeat falsetto hook. 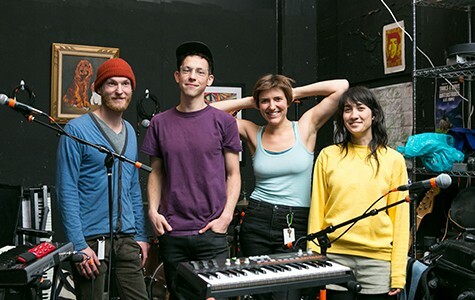 Trails and Ways' new album — from Seattle-based Barsuk Records, with a release show on June 5 at the Independent (628 Divisadero St., San Francisco) — presents an array of infectious leads and propulsive beats. Many of the songs are unconventional both in the subjects they cover — including subtle lyrical ties to environmental activism and social justice — and in the globetrotting influences, notably bossa nova (inspired by Brown's time abroad in Brazil). 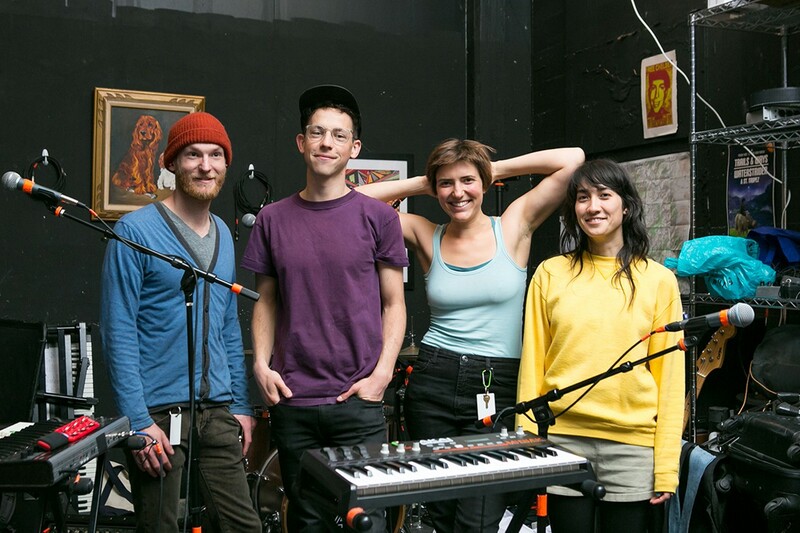 In addition to Brown, Trails and Ways includes Ian Quirk, drummer and producer; Emma Oppen, bassist; and Hannah van Loon, lead guitarist. The four musicians — who met at UC Berkeley and now live in Oakland — all sing and have songwriting credits on Pathology, which they recorded last year in Quirk's bedroom. When I met Brown and Oppen at their rehearsal room in the Oakland Music Complex, one of the first topics they brought up was the imminent apocalypse due to society's apathy about climate change. "It's going to happen!" said Oppen, with Brown adding, "Unless Trails and Ways has something to do about it!" Since growing in popularity after the release of a 2012 single, "Nunca," Trails and Ways has become a so-called "activist" band. The group used the release of its singles to promote advocacy organizations that are loosely tied to the political themes of its songs. The newly released "Skeletons" music video imagines the world destroyed by climate change, with the four band members dressed as scientists surveying the post-apocalyptic landscape. For the song's earlier release as a single, Trails and Ways asked fans to donate to Our Power Campaign, a national project dedicated to fighting climate change while providing jobs in vulnerable communities. "We're trying to figure out how to be an ethical band," Oppen said. And Brown doesn't just use Trails and Ways to confront climate change. He is also the founder of Floatmap.us, a nonprofit website that uses federal data to map projections of flooding in the US in 2040 through 2070 if the country fails to curb global warming. Brown said he hopes that Floatmap.us inspires people to think about climate change in a way that's more emotional or powerful. "I really want to make art that expands the range of our empathy and compassion for other people and the planet," he said, noting that Floatmap.us is designed to show that people's homes and schools could be under water in the near future. Ultimately, listeners don't have to ascribe to any political platform to enjoy Trails and Ways. One strong Pathology track is "Say You Will," which Oppen wrote about falling in love and features tight four-part harmonies. Quirk's love of pop music helps infuse the songs with the basic listening pleasure of up-tempo feel and groove, Oppen noted. "The interlocking pieces of a song can be complex and come from a dark concept and yet interlock in a way that makes you want to move."